Most of the undergraduates may be gone for the summer, but activity in the College certainly has not slowed – especially for all of those involved in our research/discovery mission. Jim Beatty, Superintendent at the Agronomy Center for Research and Education (ACRE), and his crew have been busy working with 37 faculty, along with numerous staff members and graduate students, to get their 2011 field trials planted (in a really challenging Spring). Ditto for Jerry Fankhauser, Director of the Purdue Agricultural Centers (PACs) and the eight Superintendents of these farms around the state. For our researchers, summer is about papers and proposals, conferences and symposia, finishing theses and dissertations, field work, and welcoming new graduate students. Our strategic plan talks about “research with purpose leading to discovery with impact”. It is a simple but powerful phrase and captures the spirit of our College’s research mission. Whether we are talking about the work of Jody Banks (Botany and Plant Pathology) sequencing the genome of Selaginella (published in the journal Science and featured on NPR’s All Things Considered), or the applied crop management work of Bob Nielsen, Tony Vyn, Jim Camberato (and a host of others) that has been so important in this very wet, very cold Spring, our faculty, staff, and students engage in research that makes a difference in addressing important societal problems. Basic and applied; life, social, and engineering sciences; plant, animal, food; —these themes reflect the societal issues we are working to address and the range of science that is our College. This year will likely be our best ever from a research funding standpoint. Through April this fiscal year, College research faculty, staff and students have submitted 660 proposals and generated $65.1 million in sponsored program funding —well ahead of the same point last year, when we stood at $50.6 million. The Pre-Award Center, led by Amy Wright, has made a big difference in our ability to support faculty in seeking external funding. Associate Dean Karen Plaut is building her Agricultural Research team to bring additional support to faculty, and Dawn Parks has quickly become a key resource in the College. In addition, Karen has been leading an effort to deepen and expand our industry relationships. Looking forward, as a College we need to take our support of the research mission to an even higher level. The House of Representatives version of the federal 2012 budget is not kind to research funding. Changes at NIFA have left voids where no funding opportunities are available. The focus on fewer, larger projects has broad implications on how we compete for funding. As a result, we have a challenging agenda as a leadership team intended to better support our research mission in the future. Work on a bioinformatics core facility is nearing completion as interviews are being conducted for the Managing Director position. Karen will be bringing a new half-time Associate Director of Agricultural Research on board soon to provide much needed capacity (the position combines the two quarter-time positions that were traditionally part of Agricultural Research) and further develop the graduate program. We are working on a long-term facility plan and have a number of lab renovation proposals in front of the Provost to make some important upgrades. We are also framing a plan to enhance our ability to successfully land large scale projects and are working closely with new faculty to facilitate their success. We need progress in all of these areas to make sure our faculty, students, and staff have the resources they need to deliver on our research potential. It is easy to make the case that our College’s research has never been more important. The issues we work on make headlines every day. However, budget pressures are very real, and we have to make sure our federal government understands the impact of the research we do. Thanks to some great work by those engaged in our research mission, the Purdue College of Agriculture has an exceptional research story to tell. The College of Agriculture mourns the loss of two students who passed away in the past few days: Daniel Hamilton (left), a senior in Forestry and Natural Resources majoring in Wildlife from Hebron, Indiana; and Olukayode (Kayode) Bolarinwa (right), a graduate student in Animal Sciences from Nigeria who was studying with Dr. Layi Adeola. Our deepest sympathies go to the families and friends of these two young men. Purdue will receive $1.1 million from the Bill & Melinda Gates Foundation to determine whether a storage technology developed for cowpeas and now widely used by farmers in sub-Saharan Africa will work for other African crops. The award builds on the $11.8 million Gates-funded project called Purdue Improved Cowpea Storage, or PICS, which began in 2007. It found that hermetic storage of the staple cowpea, known in America as the black-eyed pea, was practical and profitable for African farmers and ensured a supply of the nutritious legume for many months after harvest. Without the storage, farmers would have to sell their cowpeas immediately after harvest when the price is lowest or treat them with sometimes dangerous insecticides. 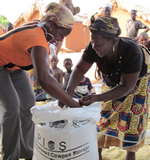 The new project, PICS2, provides for research to determine whether the Purdue-developed storage method is feasible for other crops grown in Africa, including corn, sorghum, rice, couscous, hibiscus seed and cassava chips, which are similar to tapioca. A Purdue-led sequencing of the Selaginella moellendorffii (spikemoss) genome - the first for a non-seed vascular plant - is expected to give scientists a better understanding of how plants of all kinds evolved over the past 500 million years and could open new doors for the identification of new pharmaceuticals. Jody Banks, Botany and Plant Pathology, led a team of about 100 scientists from 11 countries to sequence the genome of Selaginella, a lycophyte. Lycophytes, which are the oldest living vascular plants, shed spores to reproduce and have a single vascular vein through their leaves, as opposed to more complex vascular plants. The Department of Agricultural Economics’ Center for Global Trade Analysis held the 2011 African Short Course in Global Trade Analysis in April at the United Nations Conference Centre in Addis Ababa, Ethiopia. Twenty-five individuals from 16 different countries participated in the course, which was co-sponsored by the United Nations Economic Commission for Africa, the African Trade Policy Centre and the World Bank. The short courses in global trade analysis are long-standing offerings of the Center for Global Trade Analysis, which introduces participants to a standardized framework for conducting global trade analysis in an applied general equilibrium setting. The course also provides participants with ample hands-on training with software that has been tailored to global trade analysis and gives participants the opportunity to interact with economists working on global trade and resource use issues while becoming part of the international GTAP Network. More information on the Center for Global Trade Analysis or the Global Trade Analysis Project is available at www.gtap.agecon.purdue.edu. Four Purdue research teams aspiring to improve food sources around the world received $30,000 grants from the university's Global Policy Research Institute in partnership with the university's Center for Global Food Security. The Global Policy Research Institute and the Center for Global Food Security are working in partnership on this global food security initiative. The Global Policy Research Institute focuses on the university's strengths in science, information technology, data management and systems engineering in collaboration with economics and the social sciences to address critical issues such as poverty and climate change in a systemic way. The goals of the Center for Global Food Security, under the direction of 2009 World Food Prize winner Gebisa Ejeta, are to conduct research in areas such as climate change and nutrition that relate to food security in developing countries. The four $30,000 incentive grants were awarded to: Thomas W. Hertel, distinguished professor, AGEC; Klein Ileleji, ABE; Betty Bugusu, managing director of International Food Technology Center; and Abdelfattah M. Nour, professor of basic medical sciences in the School of Veterinary Medicine. In Steve Hallett's new book "Life Without Oil: Why We Must Shift to a New Energy Future," the Purdue plant scientist tackles the world's energy problems from a different perspective – that of an ecologist. Dr. Hallett, Botany and Plant Pathology, argues that energy is the driver of our society's success and that the loss of abundant supplies of oil will significantly impact all facets of society. Hallett argues that throughout history all societies have collapsed, usually from the loss of a necessary resource. For our current society, that resource could be oil. Dr. Hallett co-authored the book with Jon Wright, a journalist who has extensively covered energy issues. The beneficial compounds in green tea powders aren't as stable as once thought, according to a Purdue University study that will give industry guidelines on how to better store those powders. Prof. Lisa Mauer, Food Science, found that increased temperature – and humidity, to a smaller degree – speed catechin degradation. She said it had been believed that the powders were stable below the glass transition temperature, the temperature at which an amorphous solid changes from a rigid, glassy state to a rubbery, viscous state. In that rubbery state, compounds may start reacting with each other faster due to increased molecular mobility, leading to significant chemical degradation. Yellow starthistle already causes millions of dollars in damage to pastures in western states each year, and as climate changes, land managers can expect the problem with that weed and others to escalate. According to a study led by Prof. Jeff Dukes, FNR, when exposed to increased carbon dioxide, precipitation, nitrogen and temperature – all expected results of climate change – yellow starthistle in some cases grew to six times its normal size while the other grassland species remained relatively unchanged. The study was published in the early online edition of the journal Ecological Applications. The plants were compared with those grown under ambient conditions. The study is one of the first comparing the growth of invasive species versus their local competitors under future climate scenarios. Dukes believes the results indicate problems land managers and crop growers could see in the coming decades, and not just with yellow starthistle. From the start of his teaching career, technology has captivated agronomy Professor George Van Scoyoc. A 1979 Radio Shack TRS 80, Model I computer was the first of many technologies he has adapted for instruction. Today, he’s mastered Adobe Connect and Skype, among others, so his colleague Darrell Schulze and he can facilitate discussions about agricultural development between their Purdue students in West Lafayette and those in Kenya and South Africa. Van Scoyoc also uses Connect, a Web conferencing software for real-time meetings and virtual class sessions, to hold periodic virtual help sessions with some of his students. He makes use of tools like Adobe Presenter and Microsoft PowerPoint in his teaching as well. Van Scoyoc believes substantive learning occurs when students are fully engaged in course content and the learning process. To that end, he joined several colleagues in creating the Soils Resource Center (SRC) in Lilly Hall. Purdue University will help develop nutrition programs in two Indiana communities as part of a $4.5 million U.S. Department of Agriculture grant to study obesity in preschool-age children of low-income rural families in seven North-Central states. The goal of the research and Extension program is to enable communities to provide needed resources to create and maintain healthy eating and physical activity in children 3-5 years of age. Kansas State University is leading the project, which will involve a team of nutrition scientists, community development specialists, and family and youth development specialists from Indiana, Kansas, Michigan, North Dakota, Ohio, South Dakota and Wisconsin. Purdue is receiving about $500,000 to conduct its work in the five-year effort. The Purdue Plant and Pest Diagnostic Laboratory was busy this spring identifying wheat diseases for Indiana farmers and helping homeowners understand why needles on their spruce and conifers are discolored or dropping. And coming up yet this year, the lab is expecting to see more of a new pest to Indiana: the brown marmorated stink bug. The lab reported in April that Indiana wheat fields are showing signs of diseases that infect plants in the fall. The PDDL has confirmed the presence of soil-borne wheat mosaic virus and wheat spindle streak mosaic virus, among other viral diseases, said director Tom Creswell. The Pioneer Hi-Bred Foundation donated $5,000 toward the College of Agriculture’s Leadership Development Certificate Program. The Leadership Development Certificate Program provides students with experience and growth in leadership. Each student, with the guidance and assistance of a leadership coach, develops leadership learning experience that meet the program's specific requirements. In the 2010-11 academic year, 170 students and 75 faculty/staff coaches participated in the program. As the philanthropic arm of DuPont business Pioneer Hi-Bred, the Pioneer Hi-Bred Foundation makes contributions to non-profit organizations on behalf of the business and employees. Consideration for grants is given to communities where Pioneer representatives, employees, and customers live and work worldwide and support sustainable quality-of-life initiatives. Dr. Lisa Mauer, Food Science, has been appointed interim director of the Purdue Center for Food Safety Engineering. The current director, Richard Linton, will become chair of Ohio State University's Department of Food Science and Technology, effective Aug. 15. He also is a professor of food science and associate director of Purdue Agriculture Research. Professor Mauer, a member of the center, received a bachelor's degree in food science from Purdue and a doctoral degree in food science from the University of Minnesota. Her research has focused on the effects of processing on functional, physical and structural properties of food ingredients, as well as pathogen detection. A search for a permanent replacement will occur over the next year. Purdue Extension has begun a summerlong program to help homeowners manage ash trees in their yards as the emerald ash borer continues its destructive path through Indiana. Purdue’s Neighbors Against Bad Bugs, a collaboration among Purdue Master Gardeners, city foresters and neighborhood groups, has declared this season "The Summer of NABB." 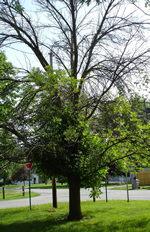 NABB participants will organize tree-tagging events at the request of neighborhood associations so that homeowners and communities can learn where their ash trees are and what they need to do before the ash borer arrives in their area. NABB also will help neighbors learn how to save money by negotiating with tree care companies for group rates on the cost of treatments and, if a tree is dying from infestation, removal. Levon Esters, YDAE, has been selected as a recipient of a Purdue 2011-2012 Teaching for Tomorrow Award. As part of the program over the next year, he will be one of ten “junior” faculty matched with two highly experienced faculty who will address important topics and experiences related to teaching and student learning. Brad Joern, Agronomy, has been selected to receive Purdue‘s 2011 Spirit of the Land-Grant Mission Award. The award was jointly announced by Chuck Hibberd, associate dean of the College of Agriculture and director of Purdue Extension, and Karen Plaut, associate dean and director of agricultural research. The award recognizes the accomplishments of a faculty member in the College of Agriculture, College of Health and Human Sciences or School of Veterinary Medicine whose work integrates the university’s land-grant mission of discovery, extension and learning. A program honoring Joern will be held in October beginning with presentation of the award followed by a seminar highlighting his program. Corey Gerber and Keith Johnson, both in Agronomy, and Kevin Smith and Russ Merzdorf, both in Ag Communication, received the 2011 Gold Award for “Purdue Extension Forage Field Guide, second edition” from the Association for Communication Excellence in Agriculture, Natural Resources, and Life and Human Sciences (ACE). Purdue Agriculture Connections received a Silver Award from the Association for Communication Excellence in Agriculture, Natural Resources, and Life and Human Sciences (ACE). The Connections production team consists of Tom Campbell, Ag Communication (Managing Editor), Donya Lester, Purdue Ag Alumni Association; Keith Robinson, Carol McGrew, Dan Annarino, Gina Price and Cheri Frederick, all of Ag Communication; and Megan Madia, Ag Advancement Office. Lindsay Birt and Rebecca Logsdon, both graduate students in Agricultural and Biological Engineering, and David Perkis, graduate student in Agricultural Economics, were featured among Purdue’s “5 Students Who are Policymakers.” In the words of President France Córdova, they work with a vibrant community of faculty researchers and thought leaders. They experience hands-on learning and leadership. They are ready to make the world a better place -- poised to craft the policies and principles that will shape our lives. They use their passions to create change that matters. Michael Hill and Eileen Luke, Entomology, received a NIFA Partnership Award for Innovative Program Models (awarded to National Plant Diagnostic Network Team members). James Kruse, Eileen Luke, David McClure, Cindy Music, Susan Schechter, and Virginia Russell all received CAPS Special Recognition. A team of Purdue undergraduate students has won a $75,000 national competition to help officials build a small hydropower system to provide electricity for vital services, homes and schools in a village in Cameroon, Africa. The students who designed the hydropower system were one of five winning teams among 55 competing universities. The project is funded through the U.S. Environmental Protection Agency's People, Prosperity and the Planet - or P3 - program. The system will power a mini power grid, providing about 150 kilowatts, or enough electricity for about 1,000 homes or 50 schools. The plant will provide power for drinking water systems, homes, health-care facilities and other entities required to upgrade rural communities. Klein Ileleji and John Lumkes, ABE, are co-advisers to the team. The Natural Resources and Environmental Science (NRES) program named its outstanding students for the Spring 2011 semester. They are Brittany Sievers (Freshman); Amy Bare (Sophomore); Ian Champ (Junior); and Rachel Huber (Senior). NRES is an interdisciplinary program that is housed within the Department of Agronomy. Purdue President France A. Córdova visited China in April, where she and the president of China Agricultural University signed an agreement in Beijing to create a joint research center that will address issues of global food security and hunger. Also present at the April 25 signing were Purdue's Arden Bement, director of the Global Policy Research Institute, and Michael Brzezinski, interim dean of international programs. Work at the CAU-Purdue Joint Research Center initially will focus on plant stress biology, including how to make crops better withstand drought and heat in Indiana, the United States and globally. The center will promote research collaborations and the exchange of information between the two institutions with the aim of increasing agricultural productivity. The second Purdue Conference for Pre-Tenure Women scheduled for Sept. 22-23 will focus on supporting women's success in higher education. Designed for postdoctoral and pre-tenure women from across all disciplines, the two-day event on the Purdue campus will feature national experts in higher education, along with informal discussions and networking with peers from around the country. The conference is co-sponsored by the Office of the Provost, the Susan Bulkeley Butler Center for Leadership Excellence in Discovery Park and the Women's Resource Office. A symposium on data-driven approaches for characterizing, understanding, modeling and responding to droughts will be held June 21-22 on Purdue¹s West Lafayette campus. The event will include speakers from a variety of scientific and technological domains, industry, other national data-driven projects and international research institutions. Register at http://drinet.hubzero.org/symposiuminfo. The registration deadline is June 14. Julie K. Griffith, an executive with Duke Energy in Indianapolis, will become Purdue University's vice president for public affairs as part of a reorganization that brings government and community relations and economic development efforts under one office. Griffith, currently Duke Energy vice president for government affairs and foundation relations, will begin at Purdue on June 20. Vic Lechtenberg, Purdue's vice provost for engagement and former dean of Agriculture, will help guide a reorganization of the university's economic development efforts before his planned June 2012 retirement. Purdue's Board of Trustees on May 17 approved a resolution of appreciation to mark Lechtenberg's service to the university. "Vic Lechtenberg and Purdue are known around the world for creating an engaged university that spurs the state's economic development and addresses global challenges," said university President France A. Córdova. "He has impacted agriculture, business development and education by taking on issues from world hunger to laying the foundation for the next generation of electric vehicles. Vic has left an indelible mark on the world, the state and Purdue." Three Purdue University professors have been elected members of the American Academy of Arts and Sciences, one of the nation's oldest and most prestigious honorary societies. Leah H. Jamieson, the John A. Edwardson Dean of Engineering and Ransburg Distinguished Professor of Electrical and Computer Engineering; H. Jay Melosh, Distinguished Professor of Earth and Atmospheric Sciences and Physics; and Ei-ichi Negishi, the Herbert C. Brown Distinguished Professor of Chemistry, will be inducted into the 2011 class at a ceremony on Oct. 1 at the academy's headquarters in Cambridge, Mass. Purdue faculty and staff are encouraged to add their upcoming engagement activities to the new campus-wide P-12 Portal, which will feature activities such as camps, programs, and events for school-age kids. The portal is available at www.purdue.edu/p12portal. Initially a collaboration between the Office of Engagement and the College of Education, the P-12 Portal seeks to serve as the hub for all preschool through grade 12 events, programs and activities as well as professional development for P-12 educators. In addition to reaching the external audience of parents and educators, the portal also seeks to serve an internal purpose -- to enable collaboration across the campus. The Purdue College of Agriculture is an equal access/equal opportunity university.